Yesterday, I shared with you the Indian-inspired feast my friend Susan and I made when she came to visit, and I told you all about the Spicy Vegetable Korma with Cashew/Tomato/Coconut goodness. Next on our menu was Mustard Greens Fried Rice. I had never tried mustard greens before, but I'm a fan of leafy things in general so I was excited to try this new-to-me veggie after hearing Susan's raves. I don't care for actual mustard, or wasabi/horseradish flavors, but I didn't mind the flavor at all coming through in these greens. Probably because I love rice so much, I'll eat it no matter what! 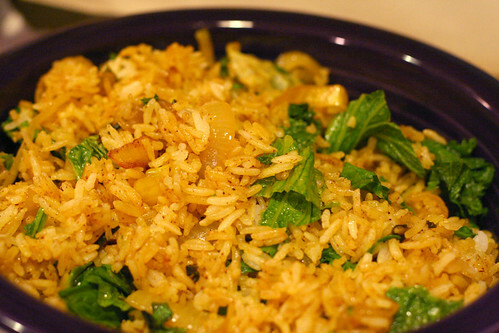 This rice was a great complement to the other dishes we chose. Will definitely be making this one again, maybe with rainbow chard (my favorite leafy "green") next time? 1. Heat the olive oil in a wok. Add the cumin seeds and cloves to hot oil. 2. Add the onion slices and green onions. Saute on low flame for 3 minutes, till onions are soft and green onions have wilted. 3. Mix in the spice powders and salt and stir until the spices uniformly coat the vegetables. 4. Add the rice to the wok along with the mustard greens. Stir well for a minute until rice is heated through and ingredients are well mixed. This looks great! I'm totally with you on the rice: I'll eat just about anything if it's mixed in with rice. I have some mizuna in the fridge, and I bet it would be great in this.